I hope you are doing well! This thank you is long overdue! 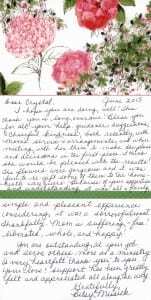 Bless you for all your help, guidance, suggestions, and cheerful kindness, both recently with mom’s service & arrangements, and when meeting with her there to make the plans and decisions in the first place. I think she would be pleased with the results! 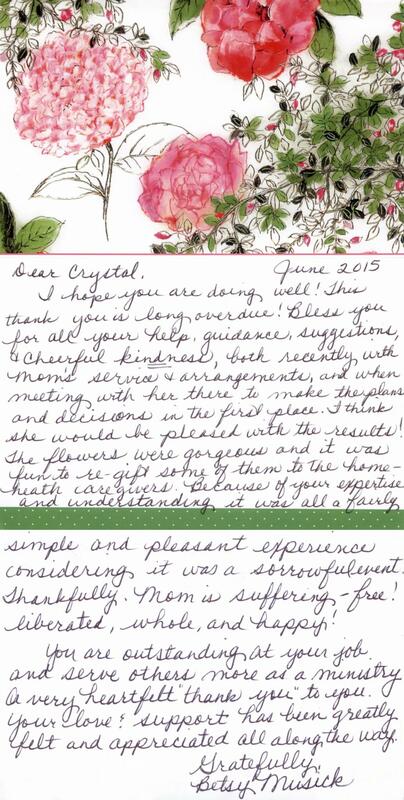 The flowers were gorgeous and it was fun to re-gift some of them to the home-health caregivers. Because of your expertise and understanding it was all a fairly simple and pleasant experience considering it was a sorrowful event. Thankfully, mom is suffering-free, liberated, whole and happy! You are outstanding at your job and serve others more as a ministry. A very heartfelt “thank you” to you. Your love & support has been greatly felt and appreciated all along the way.